This is collage number four in my ongoing collage series. This particular collage is an extended or over the top version of my first collage. 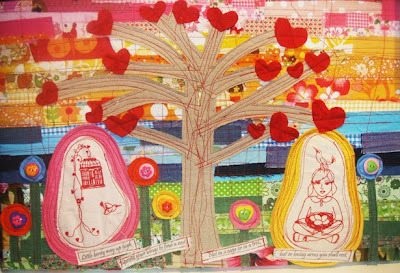 I'm loving these collages as they give me the freedom of doing a bit of over the top crafting. In other areas I have to show a bit of restraint, but with the collages I'm just giving myself full reign to whack as much or as little things on them as possible. I love this collage and it sold at the market on Saturday. Last month was the first time I had my collages on sale and frankly found it very difficult to sell them, because I became very attached to them. Now I'm trying to look at it differently and am enjoying people's appreciation of them and can actually hand them over to their new owner. Ok, I'm still not completely at ease with giving away something I love, but I'm getting better at it. I can imagine that these lovelies must be very hard to part with - looks like a lot of work and a lot of love. This is such a gorgeous composition.